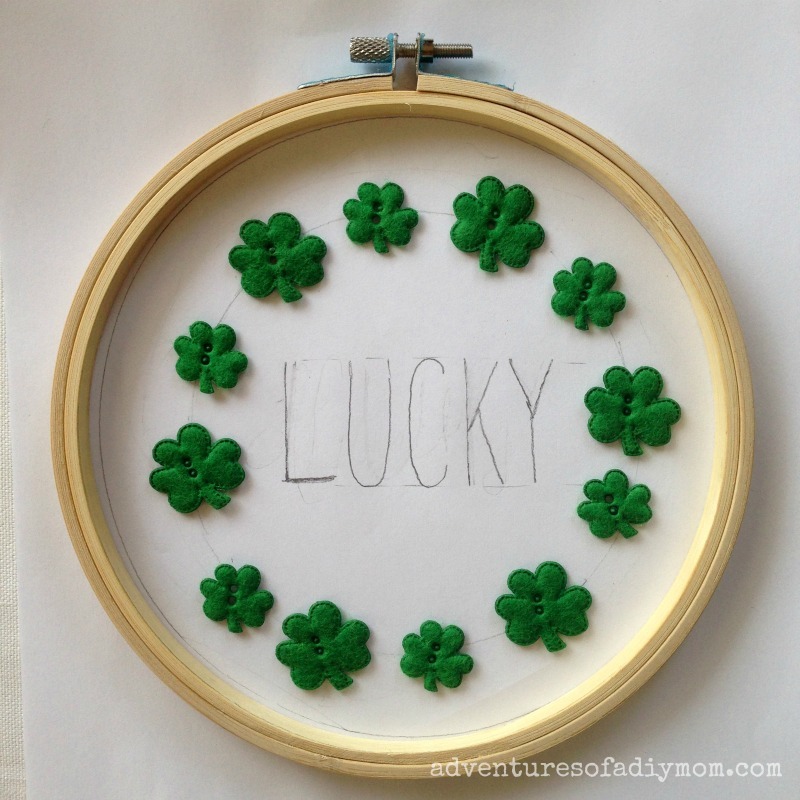 Create an easy embroidery project using fabric, thread and felt buttons. Perfect for any season or holiday, simply change up the buttons/thread to coordinate. 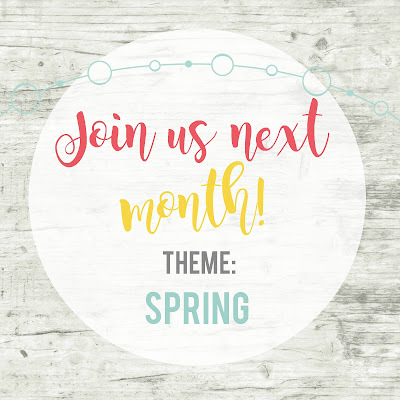 This month for our Inspire My Creativity blog hop, the theme is buttons. I didn't really have any ideas of a craft to make with buttons. So I headed to the craft store to see what kind of buttons I could work with. I came across these felt shamrock buttons and knew I had to make something with them. A quick detour to the embroidery floss section of the store and I had an idea. 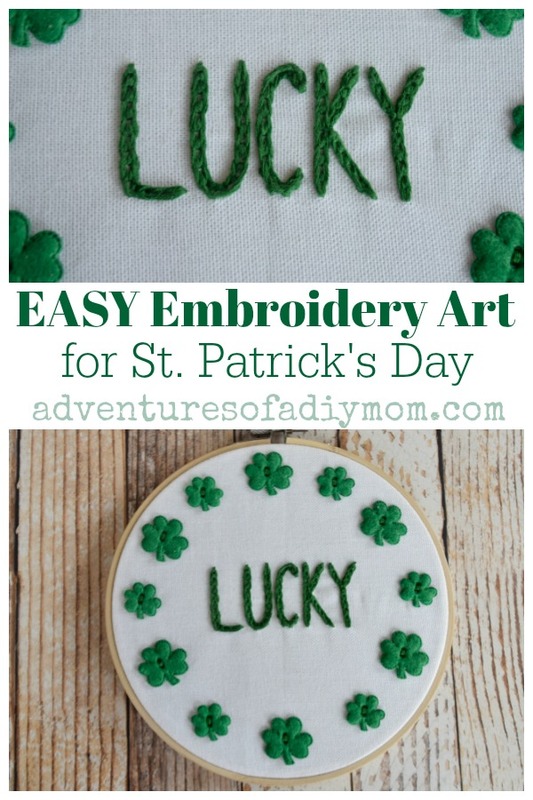 I would make embroidery art embellished with the shamrocks. It was time to make my design. I envisioned a wreath of shamrocks with swirls and curly cues. 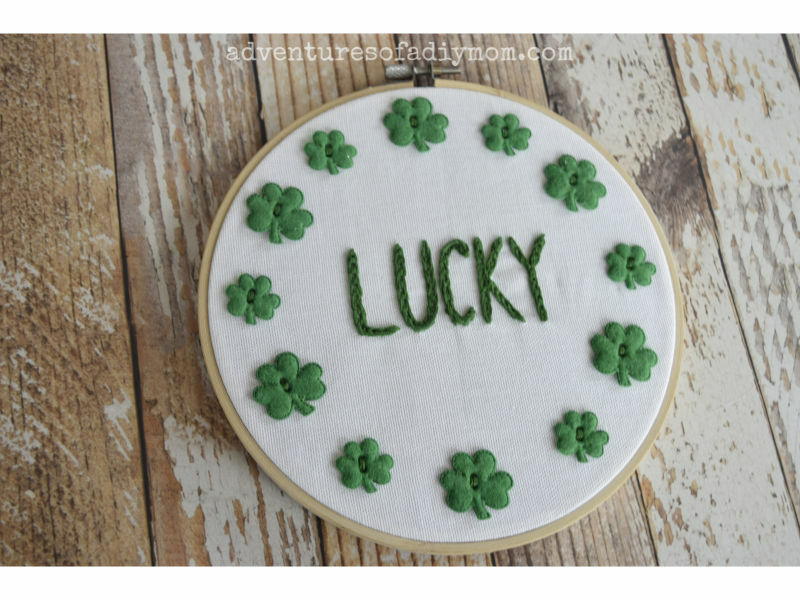 If I was home, I would probably have found a wreath pattern online, printed it off and then incorporated my shamrocks into it. However, when I made this, I was on a trip. I didn't have access to a printer and my art skills are not at the level needed to create what I envisioned. Instead, I went simple. Using the embroidery hoop to determine size, I sketched an inner circle along which the buttons would be sewn. In the center, I wrote the word lucky with block letters. There are different ways to do this. You can use transfer paper or you can use a light box. The most versatile option is to use a window, preferably with sunlight coming through it. I find it works really well and I haven't had to spend money on a light box. Or dig through my supplies trying to find transfer paper. I always have access to a window.... even when I'm away from home. Place your pattern on the window, using tape to secure it. Place your fabric on top of the pattern lining it up where you want it. Tape the fabric in place. Using a sharp pencil, trace the pattern onto the fabric. I have always used a pencil. The downside is that it's not really erasable on fabric. I just make sure that my stitching covers it up so I can't see the pencil line. There are specialty pens that will dissolve with heat or water. I would love to have one, but I have not yet invested in one. Since my design was so simple, I decided to up my skills and learn a new embroidery stitch. 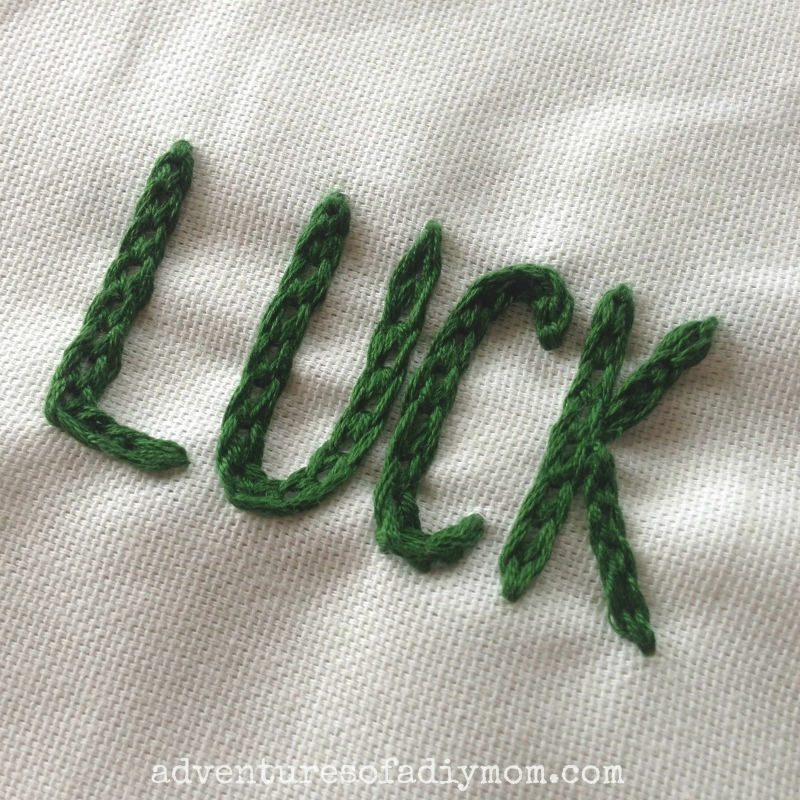 I used the braided chain stitch (see the tutorial) It creates a thick, almost embossed look. I do suggest spacing the letters a little farther apart when using this stitch. Once the word was stitched in place, I placed the buttons around, spacing them evenly. I drew a small dot with a pencil through the button holes. 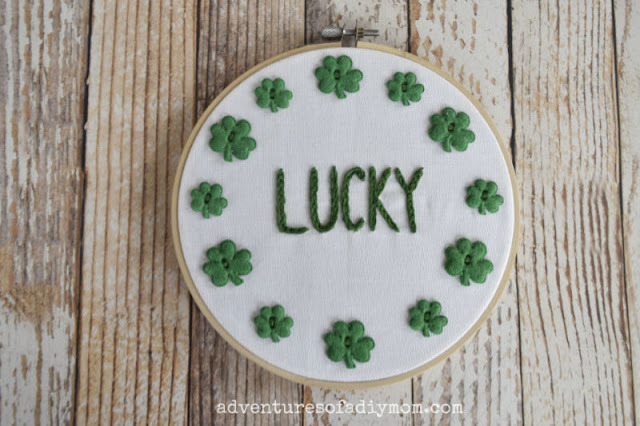 Then I began sewing on each shamrock. One of the easiest ways to finish off your embroidery hoop is found in this video. It's pretty slick! But I didn't leave enough fabric all the way around the hoop to do this method. Instead, I trimmed the edges and simply hot glued the fabric to the hoop. It's not professional looking, but it works and you can't tell from the front anyway. Now it's time to see what all my co-hosts created with buttons! Here's a list of all the co-hosts. Feel free to give them a follow! I really appreciate quick and easy projects. Those buttons were a great find. They look like you embroidered them. 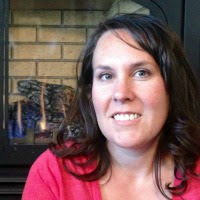 Thank you for sharing with Creative Crafters. 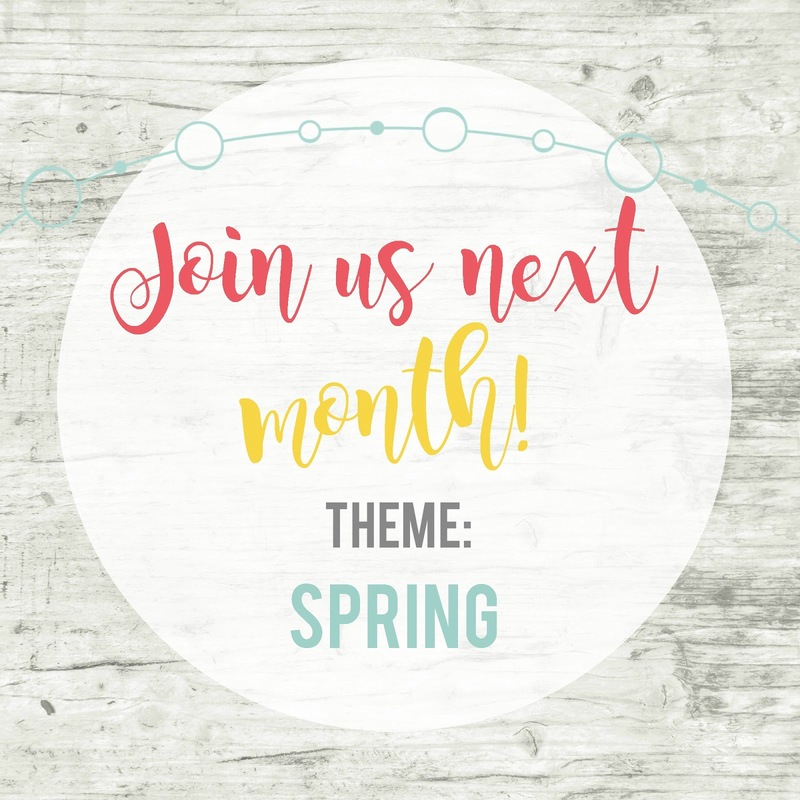 Our next month's challenge theme is Easter. If you would like to join the group you can do so here - https://www.facebook.com/groups/creativecraftersgroup/. I haven't embroidered in years. It seems to be making a comeback. I'll have to get out my hoops and needles. This turned out so cute! I love the shamrock buttons!